Dragonfly, led by the Johns Hopkins Applied Physics Lab (APL), is a concept to send a rotorcraft-lander to Saturn's exotic moon Titan. Designed to sample surface materials and measure the compositions of Titan's organic surface materials, Dragonfly would explore a variety of locations to characterize the habitability of Titan's environment, investigate the progression of prebiotic chemistry, and even search for chemical hints of water-based or hydrocarbon-based life. The instruments that would collect this this data are in development and being tested in Titan-like conditions at APL in Maryland and at other locations across the country. Dragonfly is vying to become NASA's next New Frontiers-class mission. 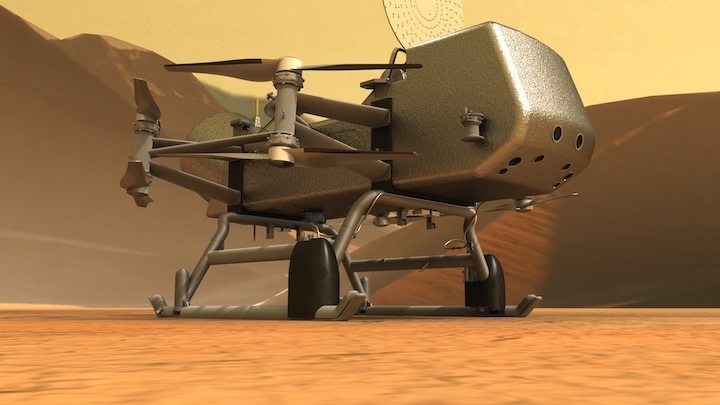 If NASA selects Dragonfly, it would launch in 2025 and reach Titan in 2034. Titan's dense, calm atmosphere and low gravity make flying an ideal way to explore – in fact, under those conditions, flight is actually easier on Titan than it is on Earth. "Dragonfly offers the revolutionary ability to visit multiple sites on Titan's surface, tens to hundreds of miles apart," said APL's Elizabeth Turtle, Dragonfly Principal Investigator. "At any of these sites, Dragonfly's focused instrument payload could help us answer key scientific questions in disciplines including prebiotic chemistry and astrobiology, meteorology, geophysics, and geomorphology." The Dragonfly team is using this stage of their study, called "phase A" in NASA parlance, to develop and demonstrate aspects of that payload. The rotary-percussive drill has been shown to generate fine cuttings in a range of cryogenic ices and organic material. And the pneumatic transfer system conveys these cuttings from the drill to a mass spectrometer with laser-desorption and gas-chromatography capability, based on the Mars rover Curiosity's Sample Analysis at Mars (SAM) instrument. A novel application of a neutron-activated gamma-ray spectrometer would quickly identify bulk elemental composition at Dragonfly's landing sites. Previous versions of this instrument have required active cryocoolers, but on Dragonfly it would be able to use Titan's cold atmosphere to passively maintain the detector's temperature. Designs for meteorological and geophysical instrumentation, identified in previous Titan mission studies, have been enhanced with a solid-state hydrogen abundance sensor, to measure spatial and temporal variations of that gas as a possible tracer of geological or biological exchange with the moon's surface. Testing of geophones and a seismometer at low temperatures show they could work at Titan conditions, and simulations of seismic wave propagation demonstrate how quakes on Titan could reveal the thickness of the ice crust that overlies its internal water oceanDragonfly's suite of cameras – derived from designs currently on Mars landers and rovers – would take images on Titan's surface and in flight. Cameras would take panoramas of landing sites, and the microscopic imager would spot materials on the surface as small as sand grains. Scientists would use pictures to characterize geologic structures and provide context for samples. Aerial imagery would provide surface geology context and be used to scout potential landing sites. The Huygens probe – the only lander on Titan to date – demonstrated the potential for aerial and landed imaging of Titan using the moon's ambient reddish lighting. Dragonfly will also use LED arrays to provide nighttime imaging of Titan materials, and ultraviolet illumination to characterize Titan's organic sediments and hydrolysis products by fluorescence. NASA is expected to decide on the next New Frontiers mission by summer 2019. Led by APL, the Dragonfly team includes key partners at NASA Goddard Space Flight Center, Lockheed Martin Space, NASA Ames Research Center, NASA Langley Research Center, Penn State University, Malin Space Science Systems, Honeybee Robotics, the Jet Propulsion Laboratory and the Japan Aerospace Exploration Agency. New Frontiers is managed by the Planetary Missions Program Office at NASA's Marshall Space Flight Center in Huntsville, Alabama, for the agency's Planetary Science Division in Washington.